Just about anything and everything that I do is Holiday inspired...in one way or another. But this little collection of Friday Favorites is especially so. Halloween is near & dear to my heart...so close it is to my birthday, and it's also right in the middle of this glorious season so rich with color and romance. And being that this is the last Friday that I'll have before the magical and mystical All Hallows Eve, I figured I'd share the love. 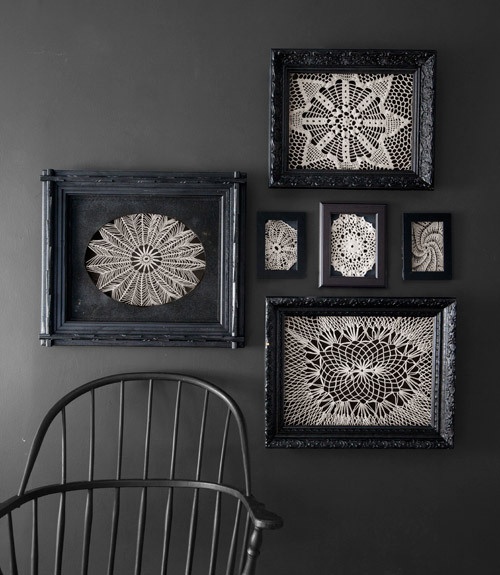 To start with are these delicate doilies, framed and matted in black. Lovingly crocheted by the skilled hands of someone's Great Granny, I love their almost spider web like appearance. 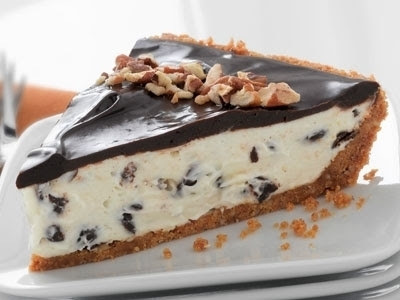 This chocolate tuxedo pie with pecan crust was double take worthy. Aaron was rushing around, looking for packing material or something, and as he was walking past me behind the couch, he could see my screen. I heard his feet screech to a halt on the wood floor and he reversed two steps to grab a second look. I have a long list of recipes that I "must make", but seriously, this one is a "must must make"! I'll be turning my kitchen into a black tie affair one of these Autumn evenings. You know how much I adore old photos. They are way up at the top of my favorite collectibles list. And to narrow the list even further...old "Holiday" photos make me melt! Black & white shots of the family Christmas tree, oh jeez...the aluminum trees from the 1950's are to die for...kids and their Easter baskets, holding stuffed bunnies...and I especially love old Halloween photos like this , kids in their costumes, they often have a creepy quality and the creepiness wasn't on purpose. Like this was just two girls in their pretty dresses, showing off their homemade masks...but the sepia tone, the age of the pic, and that barnyard shack in this rural setting just creeps me out. I love it! This photo made me laugh out loud. Seriously. I'm telling myself that the dog has a great sense of humor! Like he is fully aware of the joke. I'd like to imagine that he planned this out...his mom & dad entering the room to find him just like this...LOL! I adore these earrings from Luminoddities. 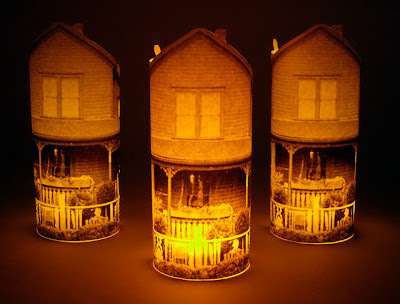 They're made from real, antique tintype images. Again, the age of the images, and the careful cropping just make them creepy. All we see is a single hand...his and hers.I really could plan am entire outfit around these. 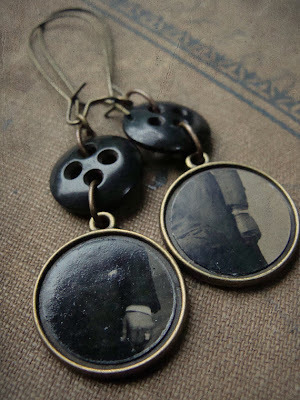 I love the time worn brass and the black buttons. 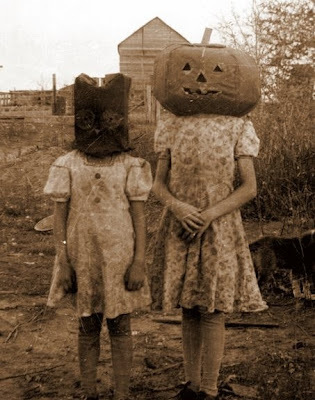 Perfect accessories for a Hallowe'en get together. And at last, I LOVE these! I'm sure you can use them all year round, but to me they scream Halloween. A super simple diy craft. 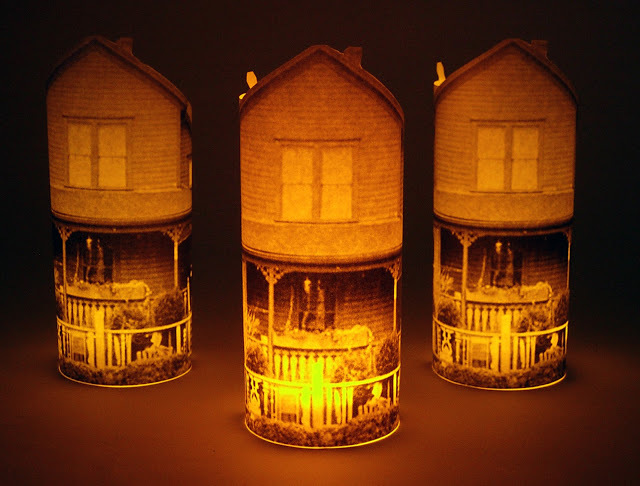 Take a pic of your house, or find an old pic, or take a pic of the spookiest house in town, even is you have to transform it into a spooky house...it could start out baby pink...all you have to do is print it out sepia toned! I just love how they glow. You can make a tiny village on a windowsill. Ok, thanks again for stopping in to see my Friday Favorites. I wish you all a happy weekend! These are all fab!! I love love love the dog ghost and loveeeeeeeee the lace doily frames!!! All of it! That pie looks incredible, but I too think the framed doilies is such a great idea. 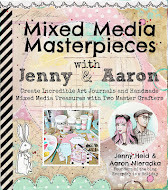 We are so lucky that creativity abounds in this world and even luckier that cool blogs let us see it all so easily! Thanks! Thank you for the laugh tonight..that dog is so doggone cute. xoxoHappy weekend. Thinking about the both of you and hoping you are safe. I hope not too much damage was done to your lovely home. Anxious to hear from you. Those house lights are great. 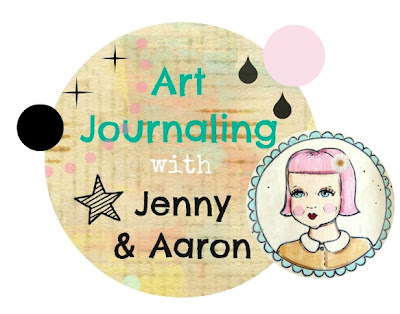 Please let us know that you and aaron are okay! 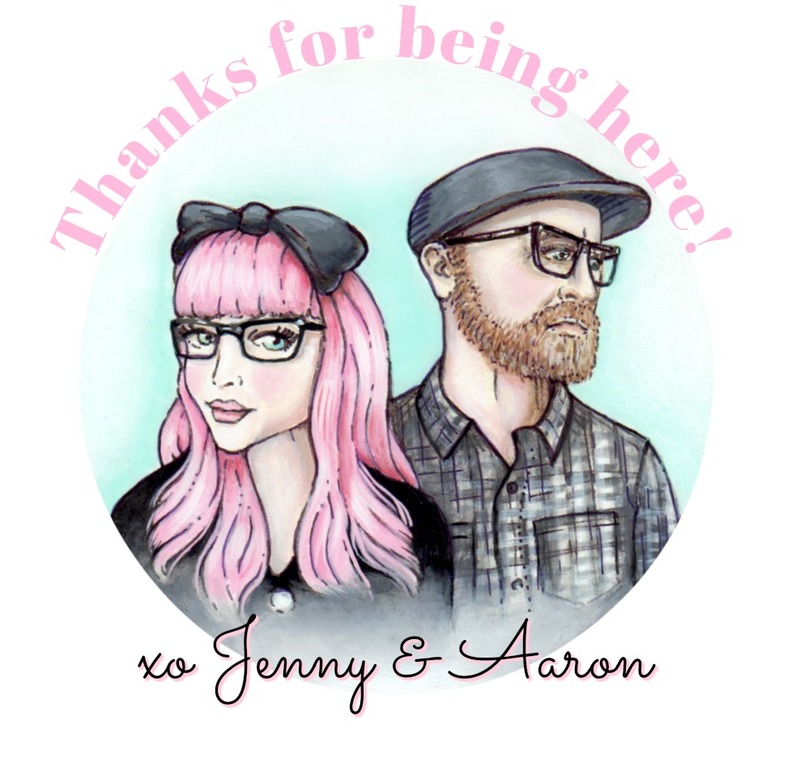 Jenny & Aaron~ I've had you & your family in my thoughts and prayers.I'm hoping you guys are safe! SO sad to see all the damage, I can't even imagine what you all are going through. I keep typing a comment and it doesn't get posted. Are you and Aaron alright? p.s. 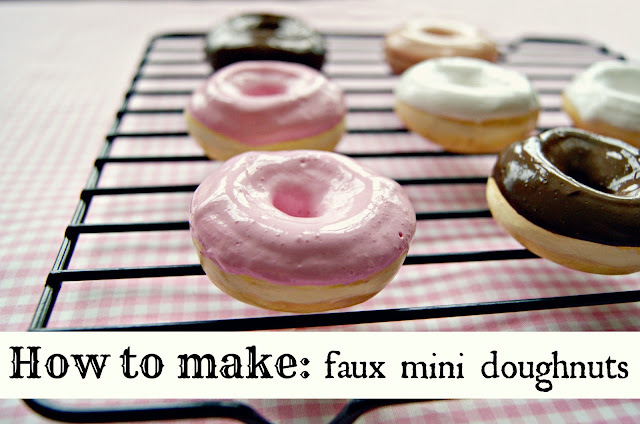 Love the doughnuts....thanks for sharing how to do them. Adore that dog. So cute. 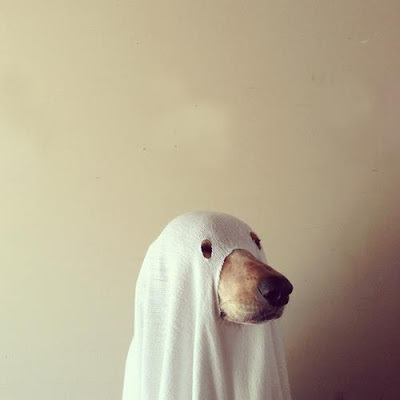 I love the ghost dog!!! Cute! I have seen all of the photos of the devestation on the Jersey Shore, and I couldn't help but think of you. I hope that you and yours are all safe and untouched by the damage. I have been watching the devestation of the Jersey Shore on the news, and couldn't help but think of you. I hope that you and yours are all safe. Love those earrings! Great find! Oh, I'm so glad you are okay. You are both in my thoughts and prayers as you start the big job of cleaning up. Be safe.